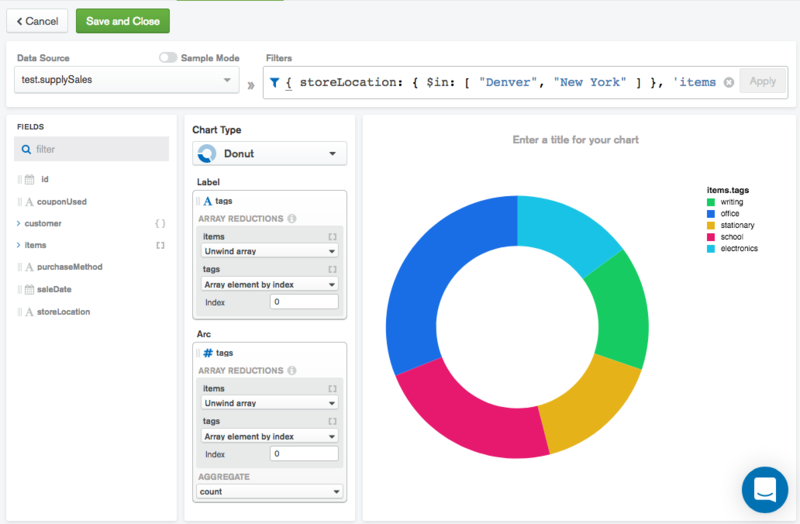 MongoDB Charts brings dynamic visualization to your data and now you can embed those live charts and graphs into web pages, apps, blogs and more. And the best part - Embedded charts are really simple to deploy. 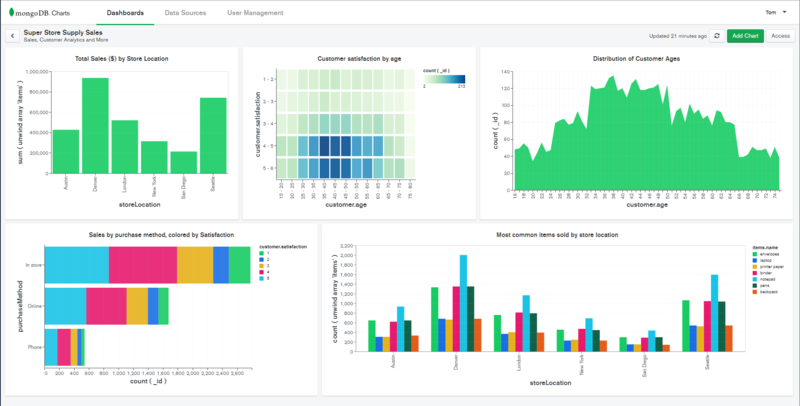 Earlier in the year, we announced the availability of MongoDB Charts Beta, the fastest and easiest way to build visualizations of MongoDB data. Today at Mongodb.local San Francisco, we are excited to announce that an update to the beta is now available and integrated into MongoDB Atlas, our hosted database as a service platform. This means that Atlas users can now visualize their data and share with their team, without the need to install or maintain any servers or tools. 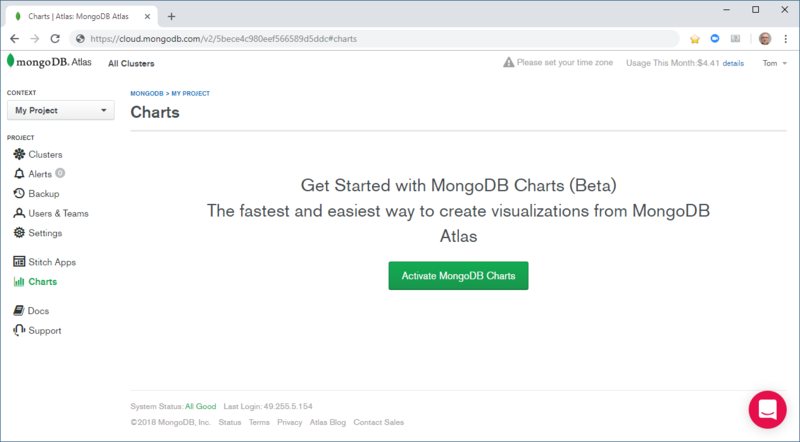 Getting started with MongoDB Charts in Atlas couldn’t be simpler. After logging into Atlas, select the Project with the clusters containing the data you want to visualize and click the Charts link in the left navigation bar. After a one-time step to activate Charts, you will be ready to start charting! If you’ve used MongoDB Charts before, the new Atlas-integrated version will be instantly familiar. The main difference is that you can easily add data sources from any Atlas clusters in your project without needing to enter a connection URI. You’re also freed from the burden of managing users separately, with all Atlas Project members able to access Charts with their existing Atlas credentials provided they have Data Access Read Only role or higher. We’ve also been busy adding some of the most requested features to the charting experience. 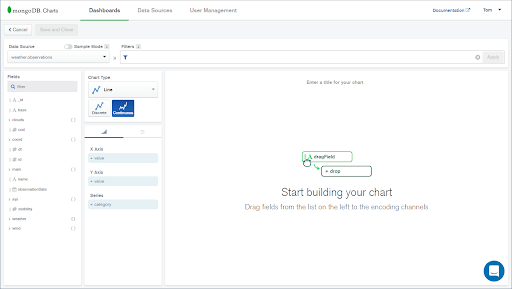 Charts has always been great at handling MongoDB’s flexible schema, allowing you to build charts from document-based data that contains nested documents or arrays. In this latest release, we’ve added a number of options for chart authors to customize their charts, including changing axis titles, colors, date formats and more. After you’ve created a few charts, you can arrange them on a dashboard to get all of the information you need at a glance. Dashboards can be kept private, shared with selected individuals, or with everyone in your project team. If you’re not currently using Atlas, we haven’t forgotten about you. 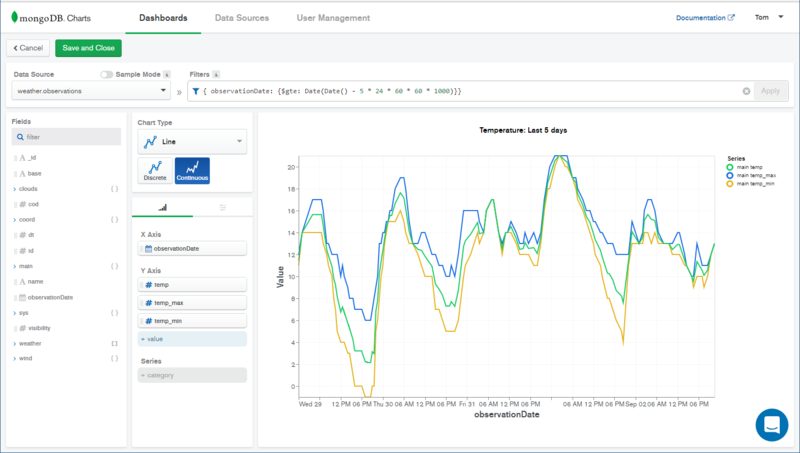 MongoDB Charts Beta is also still available to install into your own server environment, allowing you to visualize data from any MongoDB server. We’ll be refreshing the on-premises beta to include the same charting enhancements as seen in the new Atlas version over the coming weeks. We hope you enjoy this update and that it helps you get the insight you need from your data. If you have any questions or feature requests, you can always send a note to the Charts team by clicking the support button on the bottom of every page. ETL is a process to extract data from a starting data source, transform the data in some fashion, then load it into another data store. Sounds simple enough, but in fact, there is a lot of work going on under the covers and a lot of steps and decisions to navigate. These additional steps reduce the speed at which we can get meaningful insights from our data. Further, they rely on many assumptions about transforming data into what is assumed to be the correct format for later consumption - without knowing very much about the business questions to be asked of this data down the road. Latency & Downtime - There is an inherent cost of moving data from point A to point B. Forty years ago, when ETL started, we were working with megabytes of data and not needing “instant” access. Today we’re dealing with terra or petabytes of data and needing real-time insight from that data. Moving data across the network isn’t free. On a 100 BaseT network, transferring one gigabyte of data takes 100 seconds. A terabyte takes 10,000 seconds or over two and a half hours. All assuming that it’s on a dedicated network that isn’t used by other applications. 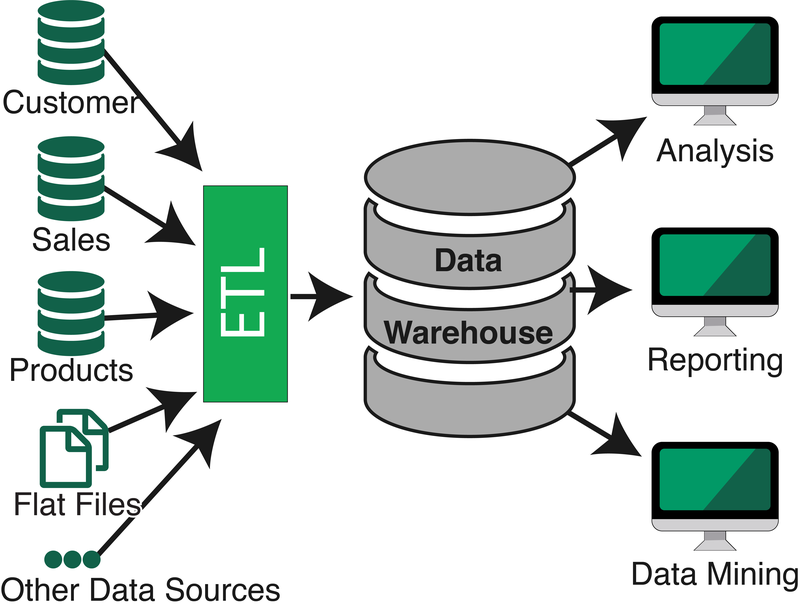 At ETL demands grow, data could easily be stale by many hours. We used to be able to schedule these transfers during “downtime” at midnight. However, in today’s global world, users are always online somewhere demanding instant access and insight. Downtime is simply no longer acceptable and latency has become the new downtime. Should suppliers on one side of the world suffer from poor performance just so executives on the other side of the world have up to date dashboards in the morning? Storage is cheap, labor is expensive - Data warehouses started at a point in time in which storage was expensive. In 1981, one gigabyte of data storage cost about $290,000. Today that cost is under $0.10. It was, therefore, important to transform and compress as much data as possible when storing to save costs. As storage costs have decreased, labor costs have gone the opposite direction. Having a good database administrator to design, manage, and maintain your data warehouse and ETL path is expensive. Storing raw data is frequently seen as a more economically viable choice. ETL is hard - ETL takes planning. Lots of it. And not just for your current load of data, but for what might happen to the load down the road. Additionally, ETL scripts can get long and complex. Bringing in data from a variety of sources, looping over them, adding logging, error handling, configurations are just the start. Determining how the data needs to be transformed can be complex, and fragile. What happens if data stored today as a string gets changed down the road? The process breaks and adjustments need to be made. Do you ever wonder why the first answer out of a DBA’s mouth is an emphatic “No!” when asked if something can be changed? One “simple” change can mean changing dozens or hundreds of lines of code. For these reasons and more, ETL requires planning for current and future data needs, loads, and shape. Are developers the right people to build the ETL pipeline? - Developers are great at many things, however, knowing about data storage and ETL pipelines aren’t often one of them. ETL design and implementation are typically best done by data engineers. While a developer may be able to get data through an ETL pipeline and into a data warehouse, generally speaking, it often isn’t done in the most efficient manner. Specialized data engineers should be responsible for these tasks. If you don’t have them on your team, this is another cost of ETL. Maintenance headaches - As the size and complexity of data, applications, and analytics requirements grow, so does ETL maintenance. Maintaining changes in data velocity, formats, connections, and features takes time. Many of these challenges may not be thought of at the start of a project, but lead to long-term maintenance needs. 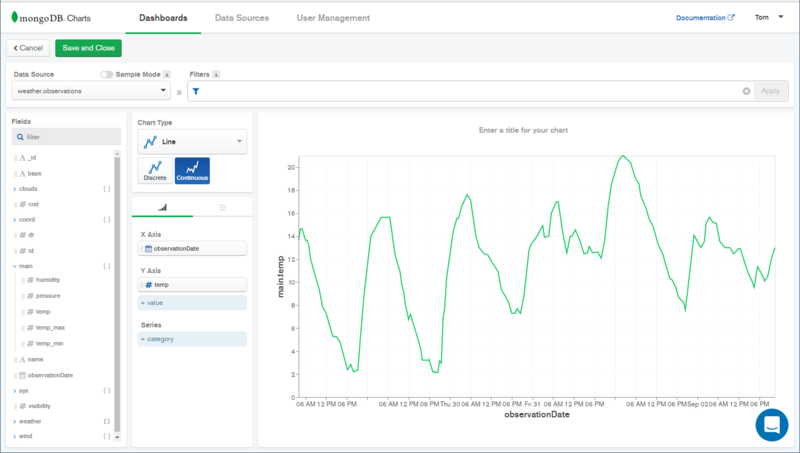 Download MongoDB Charts and start visualizing your MongoDB data today. We are living in a world full of APIs - one where any data about your devices, your community and even yourself is just an HTTP call away. But while the data returned from APIs can be incredibly useful, it is often just a point-in-time snapshot that makes it impossible to get a complete picture of what’s going on. 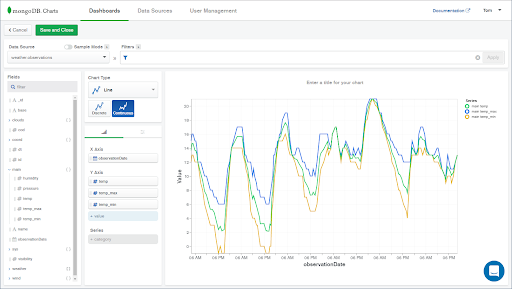 To get the insight you need, a useful pattern is to ingest the data from the API into a database and then analyze and visualize the data to understand how it changes over time. Since most API data is represented in JSON, MongoDB is the ideal database for this data. This post describes how to complete the story using MongoDB Stitch for ingestion and MongoDB Charts for visualization. 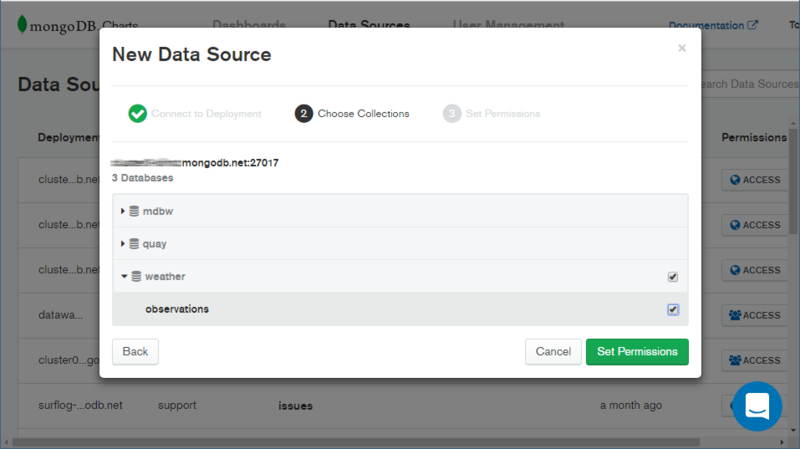 Since this is the MongoDB Blog, you won’t be surprised to hear that we’re storing the data in MongoDB. Given the data from modern APIs is usually represented in JSON, you can store it directly without needing to transform the data or lose richness defined in the original structure. But what about the other components of the solution? The Ingestion Function runs infrequently, so it’s well-suited for a serverless compute platform. You could definitely use a platform like AWS Lambda or Azure Functions for this task, but since the goal is to write to MongoDB, the quickest path will be to use MongoDB Stitch. This gives you simple, rule-based access to MongoDB collections without needing to worry about connection URIs, drivers or package management. Stitch does not currently have a built-in scheduler. However, Stitch allows you to expose a function as an HTTP Webhook, allowing it to be easily called by a scheduler of your choice. Finally, to query, filter and visualize the data we are going to use MongoDB Charts beta. This tool lets you quickly and easily create charts of data stored in MongoDB, without needing to flatten the schema or convert the data. 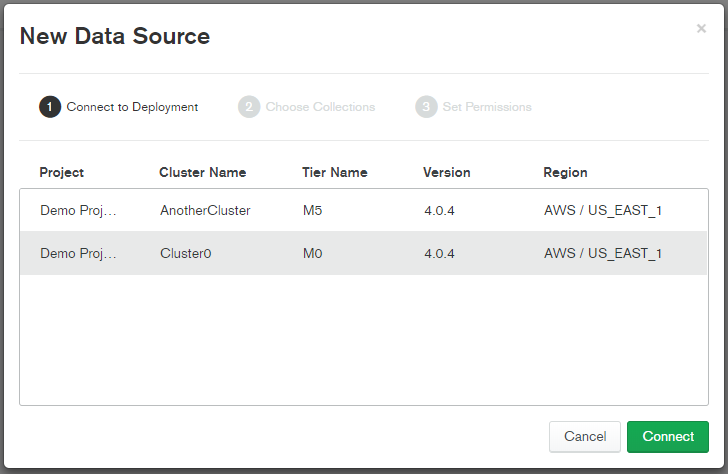 First, make sure you have a MongoDB Atlas cluster (the free tier will work just fine), and create a Stitch App against that cluster. Next, we’ll add a Stitch Value that contains some metadata needed for calling the API. This is a JSON document that specifies which city we want weather readings from (I’m using “Sydney, AU”) and the OpenWeatherMap App ID to use when calling the API (available from their website after you register for an account). Because we’re dealing with an HTTP API, we need to create a Stitch HTTP Service which is responsible for making the requests. We’ll call our service “http” and we’ll create a rule allowing it to perform a GET request against any URL. Finally, we’ll add an Incoming Webhook to the service, which is a function that can be called from outside of Stitch. 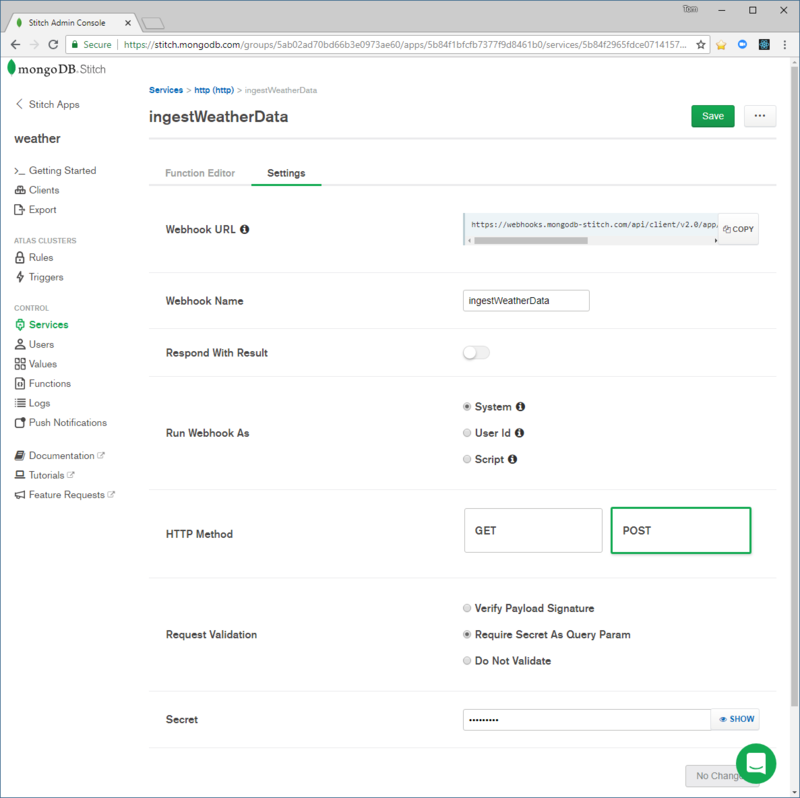 We’ll call our webhook “ingestWeatherData”, configure it to run as the System user, make it invokable via an HTTP POST, and use a secret provided as a query string parameter. Don’t forget to set your secret to a nice random value. Once you’ve configured your webhook, you need to provide the code that runs each time the webhook is invoked. This function calls the OpenWeatherMap API with the parameters from our Stitch Value. Once it receives a result, it adds a new observationDate field to the document (derived from the dt field, but with a proper Date data type), and then stores the updated document to the weather.observations collection within our MongoDB Atlas cluster. 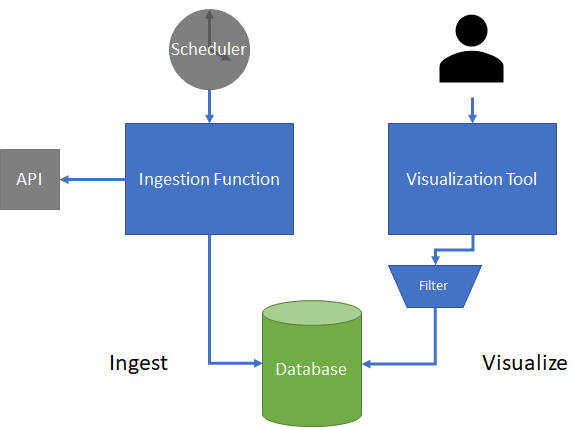 To schedule our ingestion function, we could use any scheduler we want, including one from a cloud provider like AWS or Azure or as a cron job in a VM. One simple free option is to use IFTTT which lets you create “applets” with a trigger and action. For this example, I used the “Every hour” trigger from the Date/Time category and the “Webhook” action. 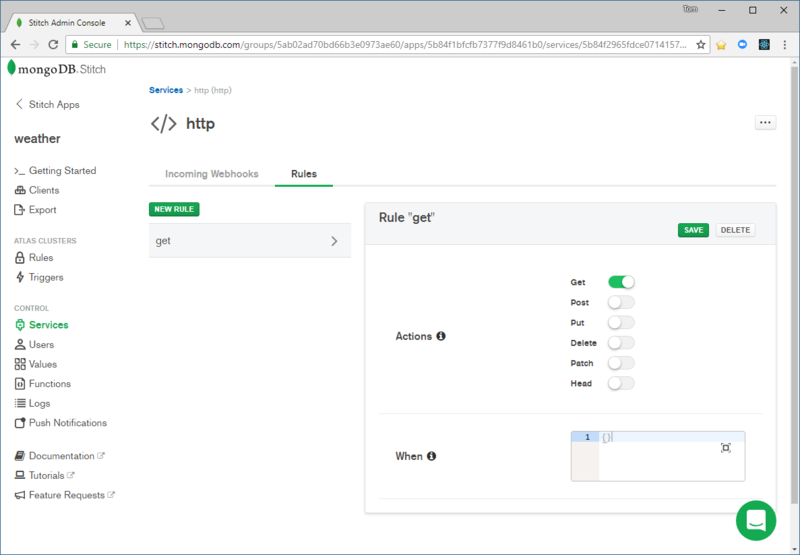 Whatever scheduler you decide to use, choose an HTTP POST and copy the URL from the Stitch webhook settings page, making sure you append “?secret=” to the end of the URL. While you’re probably keen to get started on your dashboard, keep in mind that readings are only coming through once an hour, so you may want to wait a few days until you have enough data to visualize. While you’re waiting, you can download and configure MongoDB Charts beta, and get to know the tool by following the tutorials. Once you’ve got a critical mass of data in your collection, it’s time to build your dashboard! In the screenshot earlier in this article, you can see I’ve created a number of different charts showing different views of the data. In this article we’ll go through how to create the top chart—after that, it’s up to you to replicate the other charts or come up with your own ideas. 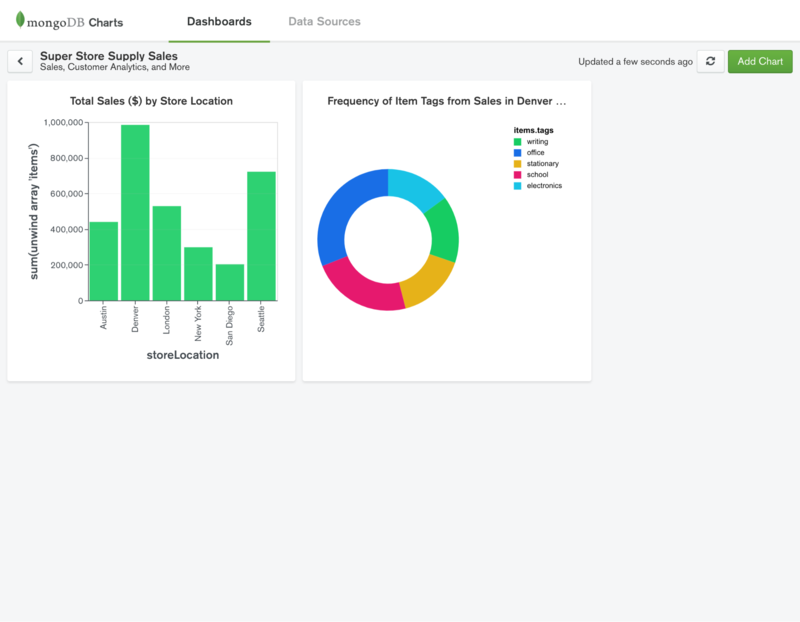 In order to visualize data in Charts, you first need to create a Data Source—simply navigate to the Data Sources tab and hit the New Data Source button. On the first step of this dialog, you’ll need the connection URI (including the username and password) to your Atlas cluster. You can get this by clicking the Connect button in the Atlas web console. While you’re here, make sure you’ve configured your IP Whitelist (on the Atlas Security tab) to allow access to the cluster from your Charts server. Back in Charts, once you’ve successfully connected to your cluster you can choose the `weather.observations` collection for your data source. 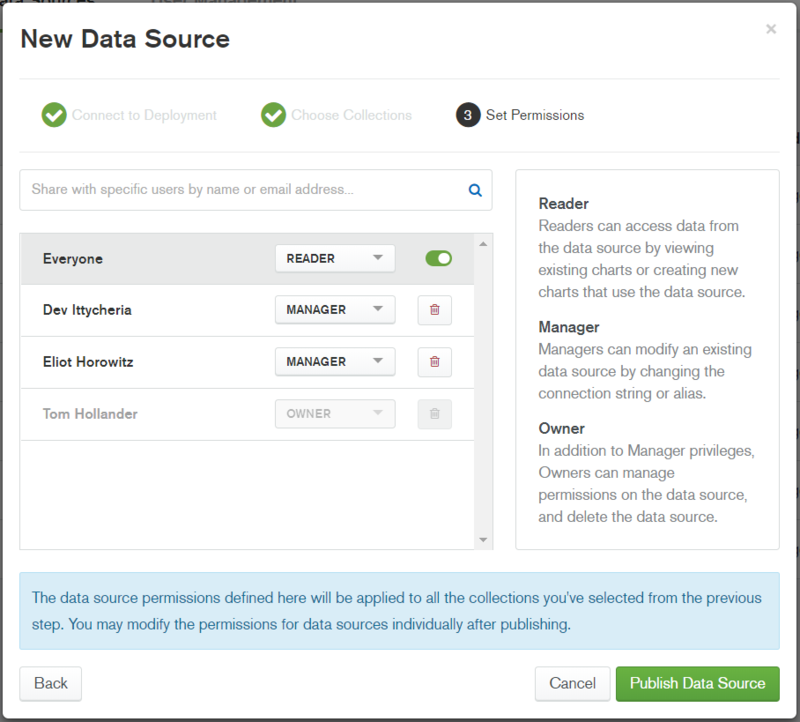 Finally, you can decide if you want to share the Data Source with other Charts users, and your data source will be created. Now we’ve got a data source, it’s time to create a dashboard. Go to the Dashboards tab, click New Dashboard and enter an appropriate name and description (“Weather” will do nicely!). You’ll now be presented with a blank canvas, ready to add your first chart. Selecting the Data Source is always the first step. Once you do this, Charts will sample the Data Source and show the resulting fields in the field panel at the left of the window. Note that the field panel also shows the types of each field, and identifies the nested documents and arrays in the document’s structure. Next, we’ll choose our chart type. To show our graph of how the temperature changes over time, we’ll select the Line category and then choose the Continuous Line chart. A continuous chart shows a data point for each individual document from the collection, as opposed to the discrete chart which aggregates multiple points together when they share the same category value. Now it’s time to encode some fields. Drag the observationDate field onto the X-Axis channel, and then expand the main nested document to reveal its children. We’ll drag the temp field onto the Y-axis, and you should see the beginnings of a useful chart! After applying the filter, you can give your chart a title and we’re done! After saving the chart, you can resize it on your dashboard, and then start to create additional charts to give you even more insight into the weather in your city. I chose the Weather scenario for the main example in this article as it’s easy to get working and something we can all relate to. However, in practice, you can probably get a lot of this info from weather websites. The real value is not so much in this one specific example but in the pattern and its implementation using the MongoDB platform. 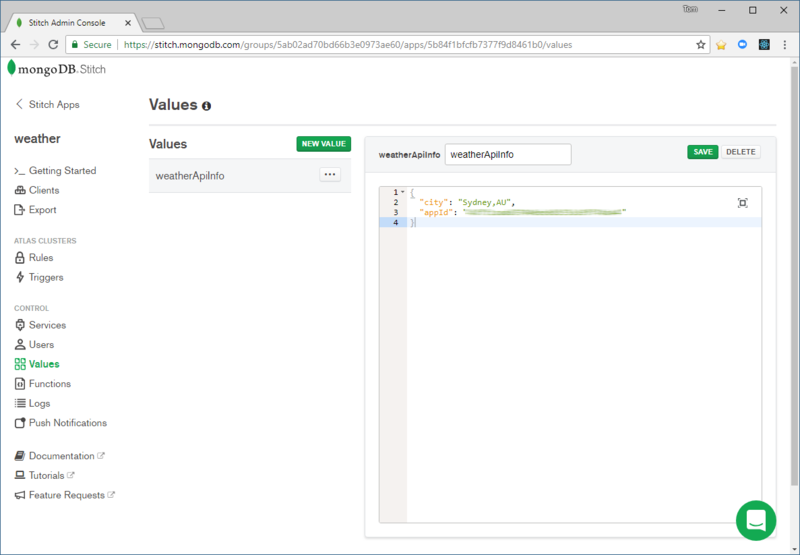 No matter what your interests are, chances are there are APIs that return data that is of value to you, and you can use the same approach from the weather example to ingest and visualize this data. The following screenshot shows one I created to show the status and history of my home battery storage system. You can see the storage level over the last week, the current storage level and understand how the usage changes over the seasons. Hopefully, this will give you some ideas on dashboards that you’d like to create. Have fun exploring and visualizing your data! Today at MongoDB World 2018 in New York, we are excited to announce the beta release of MongoDB Charts, available now. MongoDB Charts is the fastest and easiest way to build visualizations of MongoDB data. Now you can easily build visualizations with an intuitive UI and analyze complex, nested data—like arrays and subdocuments—something other visualization technologies designed for tabular databases struggle with. Then assemble those visualizations into a dashboard for at-a-glance, up-to-the minute information. 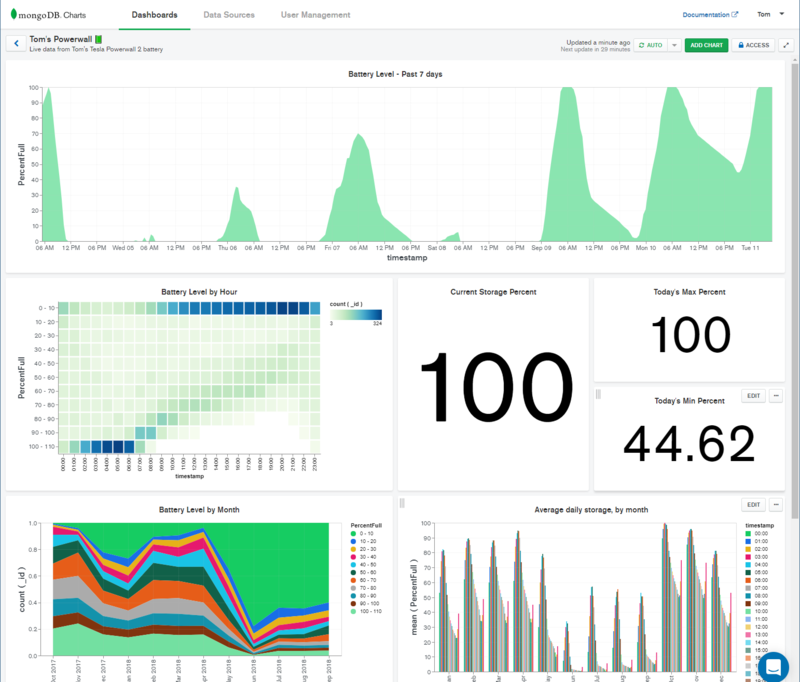 Dashboards can be shared with other users, either for collaboration or viewing only, so that entire groups and organizations can become data-driven and benefit from data visualizations and the insights they provide. 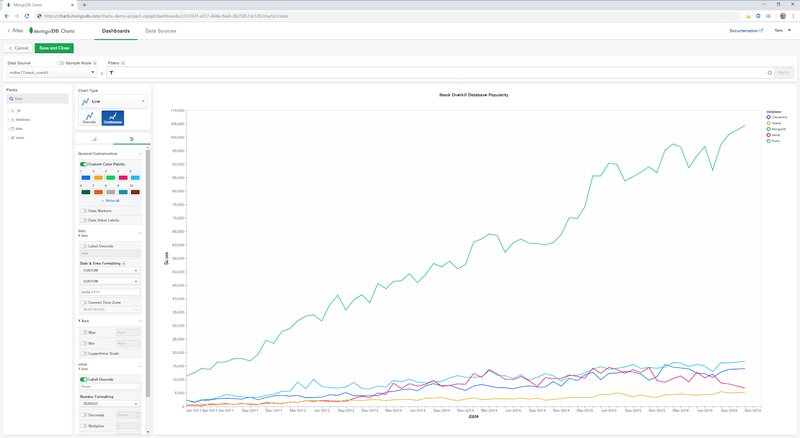 When you connect to a live data source, MongoDB Charts will keep your charts and dashboards up to date with the most recent data. Charts allows you to connect to any MongoDB instance on which you have access permissions, or use existing data sources that other Charts users share with you. 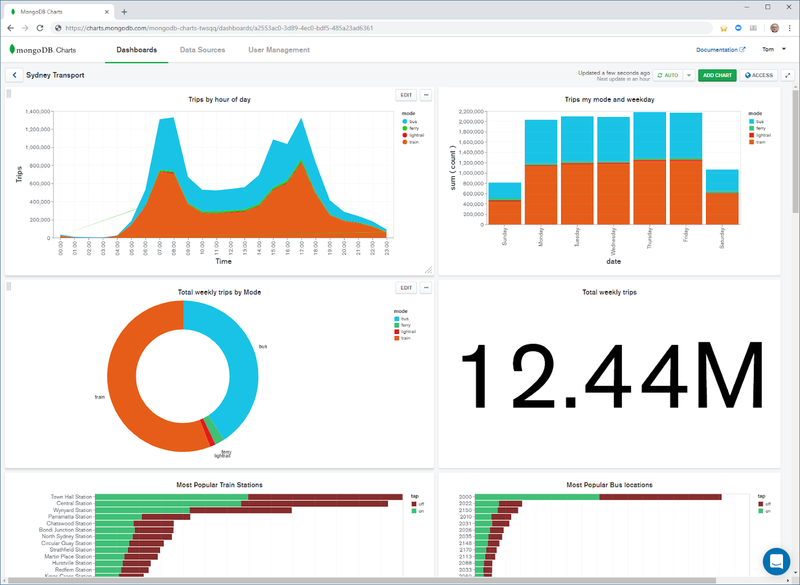 With MongoDB’s workload isolation capabilities—enabling you to separate your operational from analytical workloads in the same cluster—you can use Charts for a real-time view without having any impact on production workloads. Unlike other visualization products, MongoDB Charts is designed to natively handle MongoDB’s rich data structures. MongoDB Charts makes it easy to visualize complex arrays and subdocuments without flattening the data or spending time and effort on ETL. Charts will automatically generate an aggregation pipeline from your chart design which is executed on your MongoDB server, giving you full access to the power of MongoDB when creating visualizations. Charts already supports all common visualization types, including bar, column, line, area, scatter and donut charts, with table views and other advanced charts coming soon. Multiple visualizations can be assembled into dashboards, providing an at-a-glance understanding of all of your most important data. 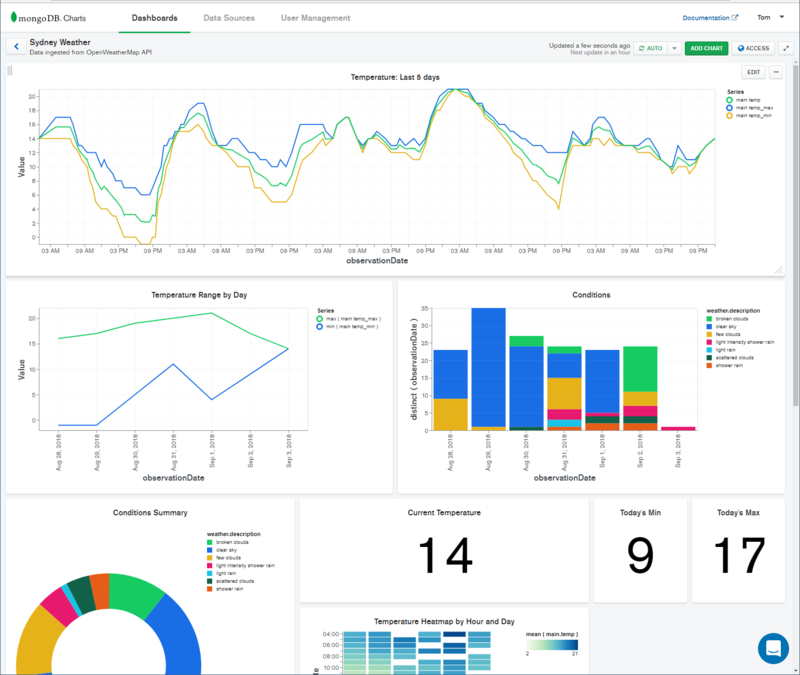 Dashboards can be used to track KPIs, understand trends, spot outliers and anomalies, and more. Graphs and charts are a great way to communicate insights with others, but we know data can often be sensitive. Charts lets you stay in control over which users in your organization have access to your data sources and dashboards. You can choose to share with your entire organization, select individuals or keep things private to yourself. Dashboards can be shared as read-only or as read-write, depending on whether you want to communicate or collaborate. Since this is a beta release, it’s free for anyone to try, but keep in mind that we may add or change functionality before the final release. MongoDB Charts is available as a Docker image which you can install on a server or VM within your environment. Once the Docker container is running, people in your organisation can access Charts from any desktop web browser. To download the image and get started with Charts, head to the MongoDB Download Center. We think that MongoDB Charts is the best way to get quick, self-service visualizations of the data you’re storing in MongoDB. But we’re only just getting started. Once you try out the beta, please use the built-in feedback tool to report issues and to let us know what you do and don’t like, and we’ll use this input to make future releases even better. The development, release, and timing of any features or functionality described for our products remains at our sole discretion. This information is merely intended to outline our general product direction and it should not be relied on in making a purchasing decision nor is this a commitment, promise or legal obligation to deliver any material, code, or functionality.